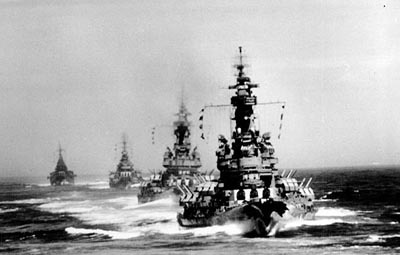 The ARIZONA (BB 39) and December-7-1941 will always be remembered as One in the United States. On this day the ARIZONA met her fate and the US Navy was thrust into a war that would bring the tragic end to many gallant ships and brave crews. The ARIZONA and her only sister ship the PENNSYLVANIA (BB-38) were completed in time for World War One but due to the fact that they were fuel oil burners, they were kept in home waters because most all the ships in the Royal! Navy burned coal and there was not enough oil to fuel these ships as well. Both of these ships were extensively modernized during the early 1930's which included the addition of anti-torpedo blisters on the sided of the lower hull and new tripod mast in place of the old basket mast that were always common to US Battleships during this period. New fighting tops and improved directors were also added at this time. Our hull for the ARIZONA features the prominent hull blisters, armor belt, the hull casement gun positions, porthole locations and the shaft exits & strut locations molded in. A detailed plans set is also included. BB-39 PACKAGE A fittings package is available for the BB-39 as in 1941. $1199.00 + S&H Includes hull, turrets, weapons and cast polymer fittings. Special Shipping: This hull can be shipped via FEDEX Ground Service as in OS-3 size package. Shipping and handling in the USA 48 states is $ 165.00. The USS TENNESSEE 8843 and USS CALIFORNIA BB-44 were the first US Navy battleships that did not have the casement gun positions mounted in hull, thus giving these ships a much cleaner appearance and reducing wetness forward. Both of these ships were at Pearl Harbor at the time of the Japanese attack. 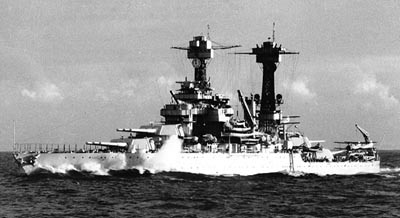 The TENNESSEE received only minor damage and was one of the first battleships to depart Hawaii. The CALIFORNIA on the other hand, was hit by two torpedoes and slowly settled to the harbor bottom. It was not until May of 1944 before the CALIFORNIA got back into the war. This hull represents the ships as they appeared prior to their early war rebuilds, and feature molded in armor belts, anchor bolsters, porthole locations and the shaft exits & strut locations. A set of arrangement plans for the ship as she appeared in early 1941 are also included. Please note: these are not complete kits, running gear, decks and building materials not included. Coming soon, a BB-43/44 hull with late war blisters. Master pattern is done, and is awaiting molding! The USS MARYLAND BB-46 was the first battleship completed with 16" guns for her main battery which made her the most powerful battleship in the world in 1921 when she was new. Although this ship was officially a COLORADO (BB-45) class battleship, the MARYLAND was commissioned over 2 years before the lead ship was. 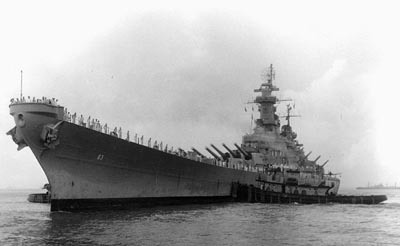 The MARYLAND was the least damaged battleship at Pearl Harbor and was soon back at sea and held in readiness to counter whatever moves that the Japanese might try against the US west coast. The MARYLAND was to be in action against the Japanese over 100 times during the war and was decommissioned in 1947 and sold for scrap in 1958. Our hull for the BB-46 features the ship as she was at Pearl Harbor and has the armor belts, anchor locations shaft exits and strut locations molded in. A plans set for the BB-46 as she during the war is included. 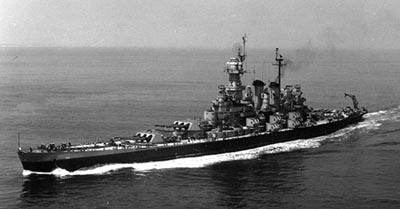 The NORTH CAROLINA (BB-55) and WASHINGTON (BB-56) were the first battleships to be built by the US Navy after the Washington Naval Disarmament Treaty which halted almost all battleship construction in the US for 15 years. Originally these ships were to be armed with quad 14' turrets, but with Japanese naval expansion in the Pacific and their failure to ratify the Naval Treaty of 1936, the design of these ships was revised to mount the new 16" 45 cal rifles in 3 triple turrets instead while these ships were in there early stages of construction. The WASHINGTON was the only US Navy battleship to engage another battleship in a gunnery dual, when she disabled and caused the sinking of the IJN KARlSHlMA in November 1942. The NORTH CAROLINA saw action in almost every campaign of the Pacific and has been preserved as a memorial and museum in her name state. This hull features the side anti-torpedo blisters, armor belts, anchor bolsters, docking keel and the inboard shaft skegs molded in. Included with this hull is a 4 piece fiberglass superstructure molding set which includes the main structure from the main deck to the 05 level, forward main director tower, and the fore & aft stacks. An outboard profile of the BB-55 and a copy from the booklet of general plans of BB 56 in 1/1/92 scale is also included. Note: On the Fittings package listed below, we now also have Photo-Etched Brass radars and Catapults available at extra cost. Special Shipping: This hull can be shipped via FEDEX Ground Service as in OS-3 size package. Shipping and handling in the USA 48 states is $ 215.00. 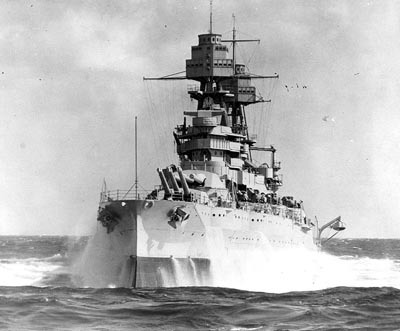 Battleships : United States Battleships - a great technical history of US Battleship design. Covers the history of this class, and others. 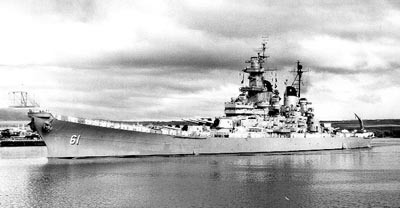 The IOWA class Battleships: USS IOWA (BB-61) USS NEW JERSEY(BB-62) USS MISSOURI(BB-63) and WISCONSIN (BB-64) are the only serviceable battleships remaining in any navy. Their superior design and construction is a lasting tribute to those who built them over 50 years ago. These ships have outlasted all other battleships by decades and are still able to meet the needs of modern naval warfare. All four of these ships were extensively modernized during the 1980's and are now stored for future use. Should they be needed again, they could be activated in just a few months. 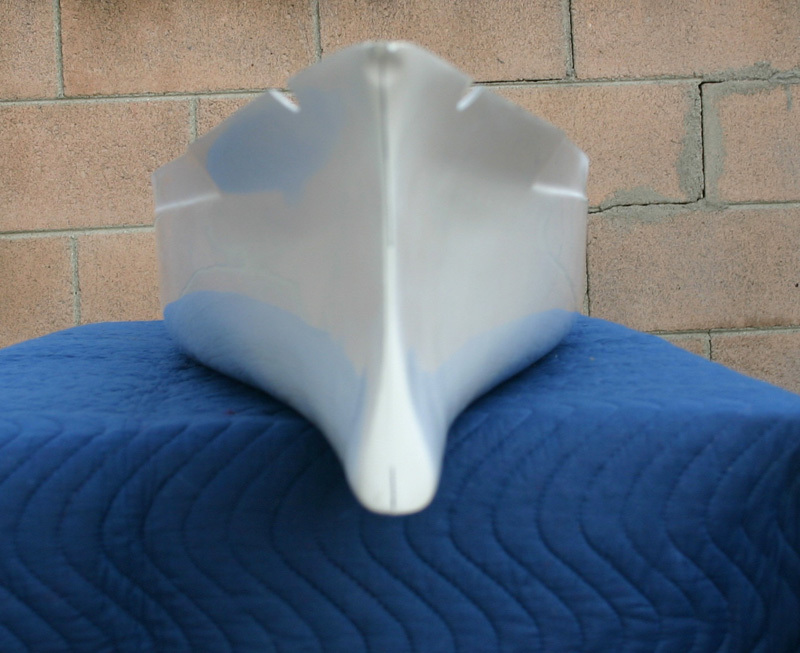 Our hull is one of the largest one piece fiberglass model ship hulls available. This hull features molded in anchor bolsters, the twin inboard shaft skegs, shaft exits are marked in, docking keel and the stern 40 MM gun tub sponsons. included with this hull is a 5 piece fiberglass superstructure molding set which includes the main structure from main deck level to 03 level, conning tower, forward main director tower with stack, aft stack and aft director tower, cast polymer stack caps with cowl and top grates. A set of plans that includes the profile, bow & stern and plan views is also included with this hull set. 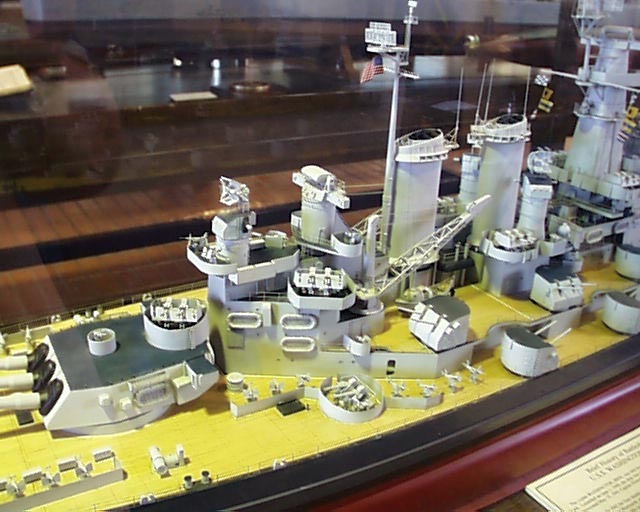 Note: The additional set of deck plans for these ships as they appeared in WW II also comes with this set. Special Shipping: This hull is too large to be shipped by FEDEX Ground, and must be transported via common carrier, such as an airline. The shipping charges must be prepaid by the customer. Shipping charges will vary according to the distance from Long Beach, CA , and the package will need to be picked up at a larger, jet served airport. These hulls can be shipped to your business or residence via Fedex Air, this can cost a few hundred dollars additional. 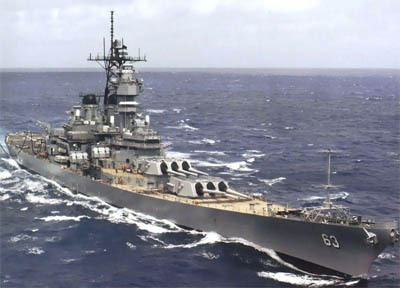 The Battleship USS Missouri - a fine documentry on this battleship. Under Siege (1992) - maybe not the best acting, but some great shots of the Mighty Mo. 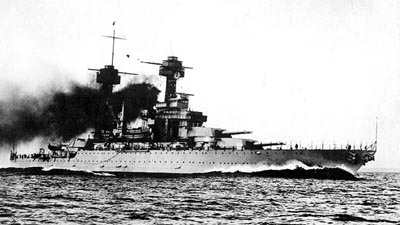 The ALASKA class Battlecruisers were designed and built in response to the German SCHARNHORST class battleships and other suspected battlecruisers that naval intelligence sources had believed were being built in both Germany and Japan in the late 1930's and early 40's. Unfortunately, by the time the ALASKA (CB-1) and GUAM (CB-2) were completed and in service, the ships they were meant to oppose were either never built or no longer existed. These two ships were still excellent as anti-aircraft screens for the fast carrier task-forces in the final stages of World War Two. Both of these ships were laid-up along with their unfinished sister ship USS HAWAII (CB-3) soon after the end of the war and were subsequently scrapped in the early 1960's. It seems that these ships were always compared with the IOWA class Battleships as to performance and usefulness, which these ships were not meant to be, so the navy and history treated these ships unfairly. Our hull for the ALASKA features molded in armor belts, anchor bolsters and the shaft exits & strut locations and comes with a set of detailed arrangement plans . The BISMARCK & TIRPITZ were the largest and last Battleships to be completed by the German navy. At the time of their completion these were the largest, fastest and most powerful battleships in service in any of the worlds navies. The BISMARCK'S career was short and famous, her only war cruise catching the attention of almost the entire civilized world. From her quick and incredible destruction of the Royal Navy's H.M.S. HOOD until her own sinking 3 days later, almost every Royal Navy warship in the Atlantic was put on alert to help track BISMARCK down. The life of the TIRPITZ lasted a few years longer, laying in a Norwegian fjord, she successfully tied down many major warships of both the Royal and US navies that had to remain on patrol to guard against her breaking out into the Atlantic shipping lanes. Our hull features the center prop shaft exit, stern anchor well, bow anchor positions, porthole locations and the armor belt molded in. A detailed set of plans is also included in the price. Special Shipping: This hull can be shipped via FEDEX Ground Service as in OS-3 size package. Shipping and handling in the USA 48 states is $ 245.00. The Battleship Tirpitz by Gerhard Koop, Klaus-Peter Schmolke Battleships : Axis and Neutral Another great battleship reference series. This book covers the Axis battleships built just before and used during World War II. Sink the Bismarck! 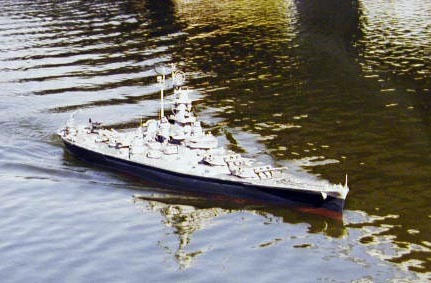 (1960) The classic movie - check out the nice Bismarck model! The German Battleships SCHARNHORST and GNEISENAU were the most active of all the big ships that were built by the German navy prior to the outbreak of World War Two. The SCHARNHORST was an almost constant consort of her sister ship GNEISENAU when both of these ships carried out successful anti-shipping raids out into the vast Atlantic ocean. 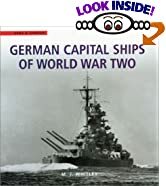 The cost to the allies in both ships sunk as well as ships and war supplies to track them down or keep them in check, far surpassed the effort it took the Germans to construct and operate these two ships. SCHARNHORST was lost in the Battle of North Cape on 26-DEC.-1943 while trying to attack an allied convoy headed to Russia. GNEISENAU was severely damaged in drydock and never fully repaired. This hull features molded in armor belts, anchor wells, porthole locations, the armored degausing cable housing, bilge keel location shaft exits and strut locations, as well as the knuckles in the bottom of the hull that these ships had. Also included is a detailed set of drawings. This hull was completed by Mr. Dave Manley of San Diego Ca. 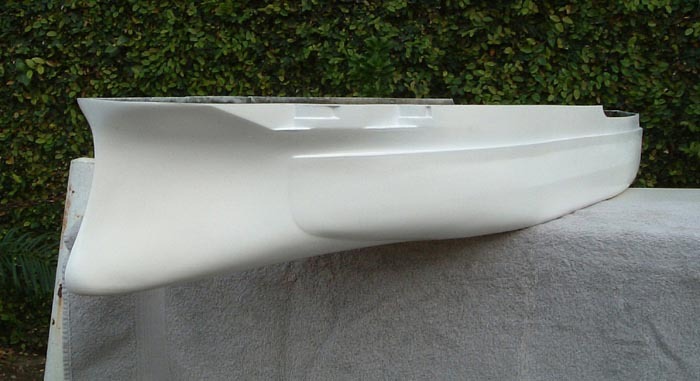 When we put it into production in August of 1998 it became one of the finest fiberglass model hulls available, truly standing above other hull s that have seen. Excellent English language translation of the German Original, highly recommended for those with an interest in the class. Battleship Scharnhorst (Conway Maritime Modellers) Battleships : Axis and Neutral Another great battleship reference series. 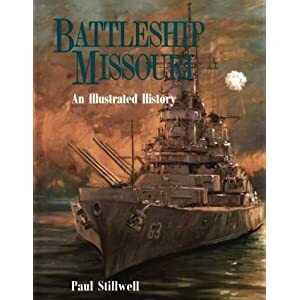 This book covers the Axis battleships built just before and used during World War II. The Japanese Super Battleships YAMATO and MUSASHl were the largest battleships ever built by any nation. The YAMATO was completed just before the outbreak of the war in the Pacific and was Admiral Yamamoto's flagship during the Pearl Harbor attack and the Battle of Midway. The YAMATO continued to be the flagship of the combined fleet even after Yamamoto's death, but for most of the war this ship was kept almost in the backwaters of operation in the south and central pacific. It was not until the Battle of the Philippine Sea in June of 1944 that this ship was committed to action, and for the first time the US Navy got a good look at her. The MUSASHl was lost in the Battle of Leyte Gulf after taking an incredible 20 torpedoes and 10 bomb hits, even then taking over 4 hours to finally sink. The YAMATO on the other hand survived long enough to be sent on a one way mission to try and stem the tide of battle at Okinawa. The massive battleship was only 50 miles south of Japan when she was overwhelmed and sunk by US Navy aircraft, again only after taking an incredible amount of damage from torpedoes and bombs. Our hull for the YAMATO features molded in armor belts, anchor bolsters, rudder skegs, porthole locations and the shaft exits & strut locations. 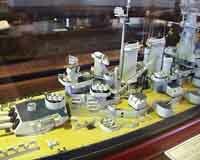 Also included is a set of arrangement plans of the ship as she appeared late in the war. Special Shipping: This hull is too large to be shipped by FEDEX Ground, and must be transported via common carrier, such as an airline. The shipping charges must be prepaid by the customer. Shipping charges will vary according to the distance from Long Beach, CA , and the package will need to be picked up at a larger, jet served airport. The Battleship Yamato by Janusz Skulski. Perhaps the definitive reference for this ship, with great drawings. Very worthwhile. Our 1/192 scale hull for the Battleship Missouri is an excellent replacement for the balsa wood built up hull that is supplied in a commercially available kit that is on the market. This size model is large enough to be suitable for radio control operations if the builder wishes. 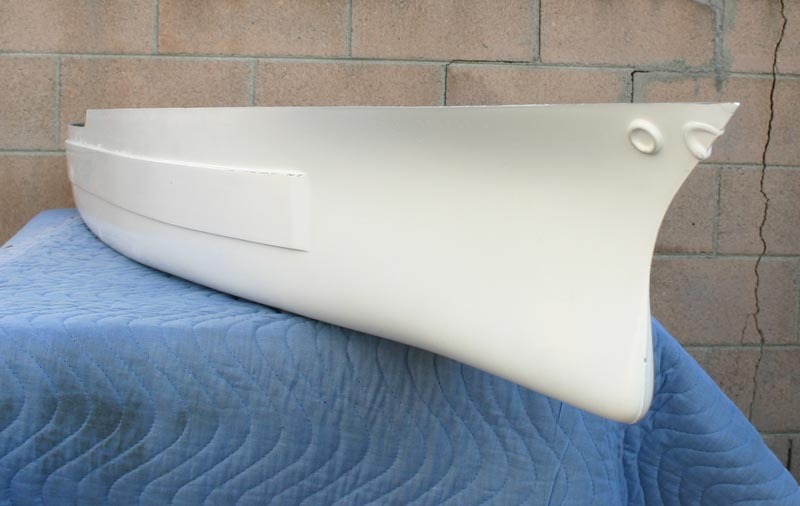 This hull has the anchor bolsters molded in and features the twin skeg hull form aft just like the original ship has, and features the ends of the twin skegs cast in polymer for easier shaft installation. A detailed set of scale plans comes with this hull.